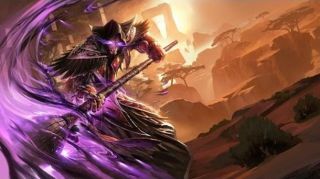 The two new Hearthstone Heroes teased earlier this week have been unveiled as the mighty Mage Medivh, an alternative to Jaina Proudmoore, and the courageous Huntress Alleria Windrunner, who can stand in for Rexxar. Alleria and Medivh were hinted at during Blizzard's announcement of Tavern Brawl, a new, challenge-based multiplayer mode. They'll join the Warrior class Hero Magni Bronzebeard, who was announced last week as the game's first alternate hero, and, like Magni, will have their own animated portraits, emotes, unique match start animations, and more. They will not, however, add new cards to your deck, change the Hero power, or constitute a new class in any way. HearthPwn cites the Korean version of Battle.net as confirming that the new Heroes will sell for $10 each, which isn't at all surprising, since that's what Blizzard is charging for Magni. All three alternate Heroes are expected to be released as part of the Hearthstone 2.7 patch that will be out later this month. Update: The good people at HearthPwn have now datamined the upcoming patch that will release these heroes. They've posted the final Hero portraits, board trays, card backs, and voice emotes if you'd like to see (and hear) an early look at them.